Yup!, she had a stern refueling station. The recycling of Navy Ships outside of the United States was stopped in 1998. When so much other recycling and salvaging had gone abroad (just look at what happens to your discarded computer and cell phone). The U.S. government, for obvious reasons, didn't want a foreign company dismantling the Navy's fleet. In my time of following ships to the recycle yards, the destination has often been Brownsville. The word "Recycling" is chosen over "Ship Breaking" or "Scrapping". have been warships. The other 48 ships are very dear to my heart because they are "SUPPORT" type of Navy Ships. Even the tow tugs that have towed these ships on their last voyage, are "SUPPORT SHIPS". My interest in the Navy returned in 2001 upon my retirement from writing standards for the Telecommunications Industry. I have not had training for writing but my content has always been respected. In that same year, I heard about a reunion for the ship I was a plank member of, The USS Kawishiwi AO-146. The reunion was in Pittsburg, PA and my wife and I made plans to attend. Guess what? Our flight was canceled because of the 9-11 ATTACK. My interest in the navy was heightened quite a bit. In 2005 we hosted the Kawishiwi reunion in San Francisco where we got a look at her for the 1st time since she was Commissioned in Philadelphia in 1955. 2005 is also the time real progress was being realized in recycling the MARAD fleet in Suisun Bay. My first "LAST VOYAGE" report was in 2009 for Pan American Victory, my 2nd was in 2010 with Mission Santa Ynez, and the 3rd for the USS General John Pope. The General John Pope departure from San Francisco was the most complete and rewarding report I have ever read. One gentleman came to watch the ship that brought him to the U.S. from Manila in June of 1945 when he was seven years old. Note: I first logged onto Facebook on July 16, 2009. I met Capt. Joe Vasey, one of the Commanders of Kawishiwi, in 2010 by email. We talked several times about saving the history of Kawishiwi and he impressed strongly the only way to accomplish this was through the use of Ship Models. 2010 is also the year the reefing of Kawishiwi started and my second tour of the Suisun Bay Fleet occurred. It was 2014 when my "OILER MODEL PAGE" was updated, which had started in 2009. In 2011, Tug "Rough Neck", was the first "TOWING TUGS" page I created. In 2014, after following 35 more ships, I thought the subject of "SUPPORT" should be more pronounced. I then created the page "SUPPORT SHIPS OF WWII". The historic ship, SS Jeremiah O'Brien is on that page under the label "LIBERTY SHIPS". Under that link I described "STEAM SHIPS" where I describe all the steam operated engines I could. My first warship following came in 2014. The Aircraft Carrier USS Forrestal CVA-61. 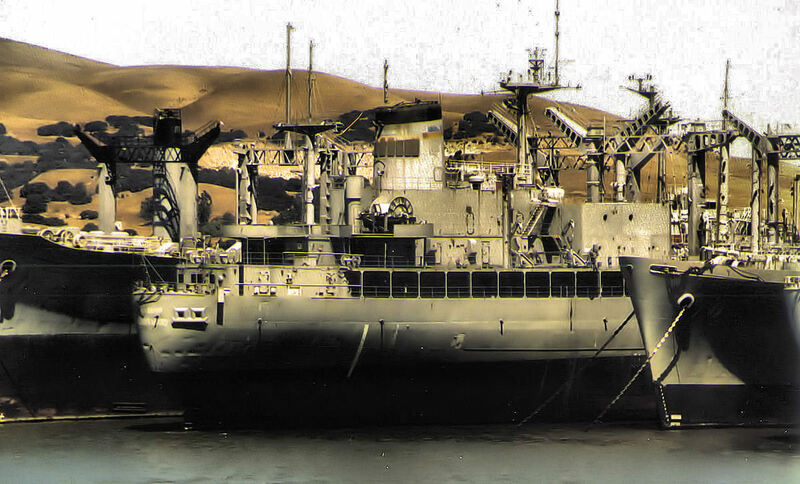 Her Tow tug, the "LAUREN FOSS", also towed the next carrier, the USS CONSTELLATION CVA-64. Just before that tow began, my wife and I were able to Tour The Tug. The only tug I have ever been aboard. With the new encounters of carriers being recycled, I started to wonder what was going to happen to all money that was raised to make these carriers into museums. Perhaps someone could create a Museum for COLD ERA SHIPS; so I made a page about that. Well, I made a lot of veterans happy with my reports. Neither the Navy or the Media think much of this work, so I guess I'm not destined to be famous.